The world is a lush, vibrant source of wonder and nourishment! It's our duty to sustain it just as it sustains us. I was seeing green since birth; my parents sought to establish eco-oriented values in me from the moment I could breathe. Recycling is a key component to a renewable lifestyable. By recycling, you help reduce the pollution caused by waste. You also cut down on the risks animals face when packaging and byproducts enter their natural habitat. Plus, recycling slashes the need for raw materials that would otherwise be harvested from struggling rainforests and other waning resources. Recycling starts at home. That's why I have made it my mission to empower my little wildflowers to recycle and grow passionate about the environment. We need to educate our kids on the natural life cycles of our planet and the need to conserve. I hope you'll join me in this effort to live as a happy green family! Here are seven ways to empower your kids to recycle. Teach Them Early: Inform them about the importance of recycling from an early age. This means living an eco-friendly life yourself so that it becomes second nature to them. Ease the dialogue of sustainability into your everyday language, teach them the words, and introduce them to animals to nurture empathy and world awareness. Convenience and Freedom: Some kids are visual learners, so be sure to have marked bins around the house for recycling. 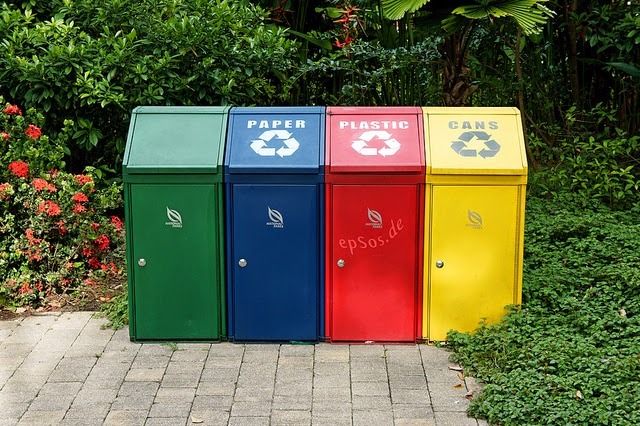 By placing a bin in their room and encouraging them to customize it, you are inviting them to become an active and eager participant in recycling. Kids learn through hands-on playtime, so it's essential to make it fun! The Cycle of Play: Make a game out of reducing, reusing, and recycling! Brightly colored bins with draw their interest and participation. You can challenge them to craft masterpieces out of natural found objects and recycled goods! My girls choose a new animal each week to design this way. And of course, it's so important to provide plenty of outdoor play opportunities for your kids! If they love nature, they'll feel inspired to protect it. Tour the Works: Sometimes you've got to see it to believe it! Not only are tours a wonderful way to squeeze more walking into your family's day, you can learn so much. Inquire about a tour through your local recycling and waste management facilities. Your children will be able to see what goes into the recycling process beyond what happens at home, and they'll gain a whole new appreciation for it. Plus, what kid doesn't love witnessing the magic of machinery? Ripen the Mind: Books, glorious books! The more your kids read, the more their curiosity and understanding will blossom. Awareness is a cornerstone for taking action. They can discover what works, what is most harmful, and what needs to be saved. The Sustainability Leadership Institute has provided a list of great children's books. Wild Child: As I mentioned earlier, this is key for empowering our kiddos to love and respect nature! If they grow up nestled by the beauty and marvel of the outdoors, it will become precious to them. We go on frequent bike rides and hikes to savor as much fresh air as possible. Gardening with the kids can also instill a sense of responsibility and gratitude for the environment. Give the Gift of Green: There are so many wonderful ways to volunteer. Sometimes, it's best to work from the ground up - literally! Kids can plant trees, join a downtown cleanup team, or volunteer to help at the local recycling facility. No green deed is too small. After all, every giant sequoia tree was once just a tiny acorn! In what ways have you taught your children the importance of recycling? Not only can you cherish and nurture the planet as a family, you can have fun while doing it! With small steps, we can help our children be more mindful of the environment. We would love to hear your input on this topic and any suggestions you might have! Please drop us a comment in the box below. Love the blog & Post! How much we need to help fix and save our planet. Your post was great and very easy to follow/read. I love the layout of the blog too!